Bright and Breezy Crafts: Blog hop....and candy! and all the Design Team are all offering Blog Candy! I had been after this image for aggges...love it! sooo retro! I had a 3d viewer just like this, with "snow white" and "disney" reels! 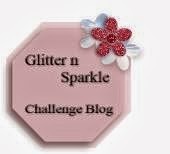 The theme for our birthday bloghop is "add glitter n sparkle"
a white, fine graph it marker. a black and white "dovecraft" 6 x 6 paper for the very back. A couple of holographic spiral diecuts finished this card. We would like you to pop to each blog and become a follower and leave a comment . 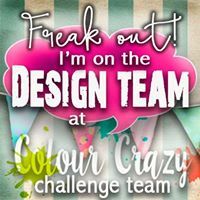 If you do this on them all you will be entered twice into the draw to win the main prize on the glitternsparkle blog which is £50 worth of stampin up goodies of your choice . If you also pop along to our fan page and like the page and leave us a comment you get a chance to win more candy there too. Sheet of clear stamps... cats n dogs. 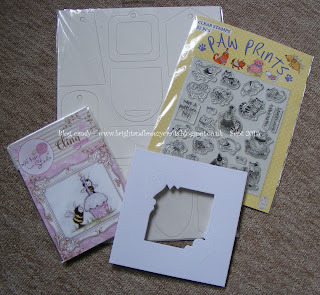 the image "viewer"- which I used on this weeks card, from Stitchy Bear Stamps. I WILL POST MY CANDY WITHIN THE UK. My blog candy will close at midnight on Saturday, 3rd Oct GMT. I will announce the winner sometime on Sunday 4th Oct.
please check back and follow, when you can! Oh my gosh, that's a blast from the past.....love it....and a great card too! Love the sparkle fab card thanks for sharing and happy birthday. So exciting! Happy Birthday to Glitter n Sparkle! Your card is gorgeous, Vic! Love all the sparkle! Doing the hop to support my teammies! fab card love the sparkly thanks foir sharing and happy birthday.There seems to be a problem with the google followers app as it seems to be missing from most of the blogs on the hop. Well this is fab, I remember these, it was my brothers but I had the Disney reels too. A great card for a male birthday, thanks for joining us at PFP this week. Congrats on the Third birhtday of the blog. Beautiful your have made. Brings back memories. Thank you for sharing your lovely work with us at Crafty Cardmakers and More. How fun! Love it!! Hopping by with a birthday hop hi! Great Card Vicky, brings back a lot of memories. Like the retro feeling of your creation. Happy 3rd Birthday. I did not see the become a follower on your blog. Congrats on the 3rd birhtday of the blog! OH my goodness! I remember having a viewmaster. Your card is adorable. 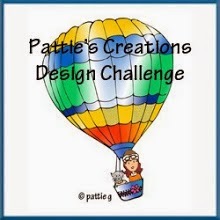 Thank you so much for joining the Creative Knockouts Challenge. A fab card and great candy too! Thank you for the chanse to winn youre great candy!! Love the retro look, fantastic creation! Thanks for sharing in Crafting with An Attitude. Great sparkly papers and love that viewer. Your card is just too cute. Great Card Vicky, love the retro look. A really fun card. Your 3D viewer image is fabulous, especially in the hot pink colour. 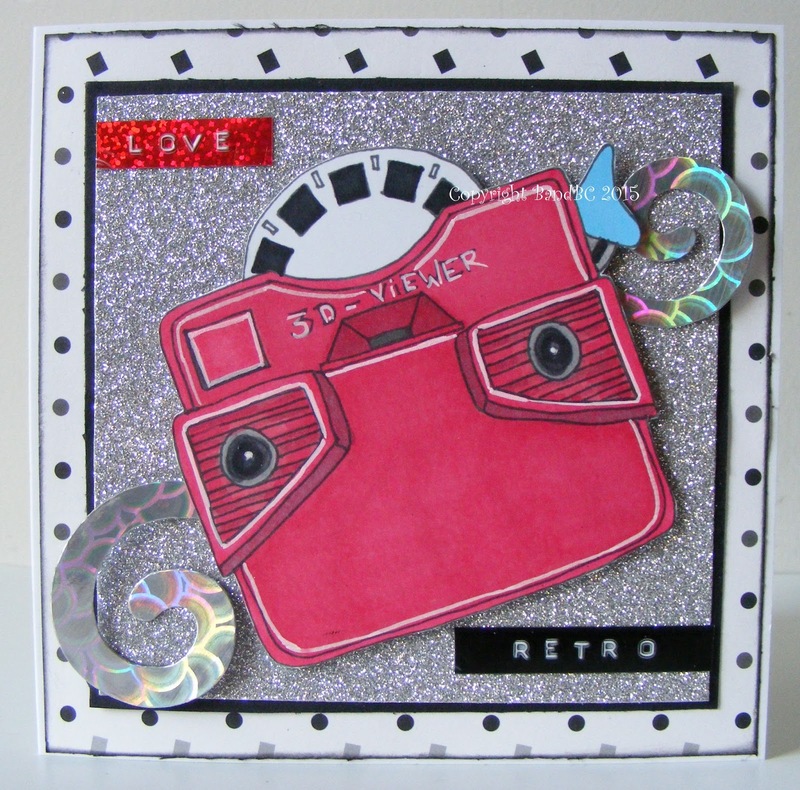 The glitter card makes a lovely background and the tape sentiments fit the card perfectly Thanks for sharing with us at Crafty Cardmakers and more. Sally.x. Love that image!!! So fun with the holographic film, too!!! I am in USA, so not eligible for your candy. Some lucky winner in the UK will love it!! I think I already commented on your wonderful project, but I am not seeing my comment and my computer is giving me fits right now....so who knows if the comment worked or not??? 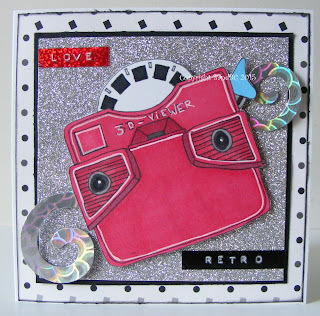 Anyway, I love the old Viewmaster on your card!!! So fun!!! Google Friend Connect is not getting along with my computer, so I can't tell if I successfully joined your blog or not. I thought it had showed that I did, but now it has disappeared again. I signed up to subscribe by email, just in case. Hope that will count. Thank you for offering blog candy. I am in the USA, but some UKer will love what you are giving away!! !